Bedazzles After Dark: Outfit Post: Red Fedora Hat & A Giveaway! Outfit Post: Red Fedora Hat & A Giveaway! Yes, I know! More hats and sweaters. The temperatures this weekend dropped to the lower 20's (ahhh!) so this outfit was just perfect for a day in the upper 40's. I can't believe that we're 2 days out from April and we've still got winter temperatures. Thankfully, I've got something that will brighten your Monday up - a giveaway! Yes, please! Lately, I've been obsessed with these leather wrap bracelets from D'Andrea Handbags. You've probably seen them all over my instagram (like here and here) They come in tons of colors and styles and just add a little "oomph" to your daily stack. Lucky for you, I'm giving one away! And the winner gets to pick any style, any color. Oh and if you haven't checked out their handbags yet, you're missing out. I love the Mr. One Nighters! American Eagle jegging in "Dark Destroy"
Aren't these leather bracelets fab?! And if you win, you get to pick which style and color you want! Pssttt... Don't forget to use the promo code NikkiLove2015 for 20% off any D'Andrea Handbags bracelet purchase. I want to be a crazy hat lady soooo badly! They are just dso perfect. My favorite is the MR. INSECURE, BLACK & WHITE. Love these! That hat is amazing. I'd choose the Mister Confident, Electric. That color is out of this world. Loving the way you styled this outfit. I love the hat in the black version. I love Mr Confident in White! That hat is super cute! I love how you pair it with a clean outfit. I love your hair too. So pretty! I am loving this fedora! You look awesome! I like the Mister Confident in Teal. I like the Mr. Insecure in Silver. Thank you. I love the Mr. Insecure, in White. It could join the arm party with my white MK watch and Vanilla MK bag!! 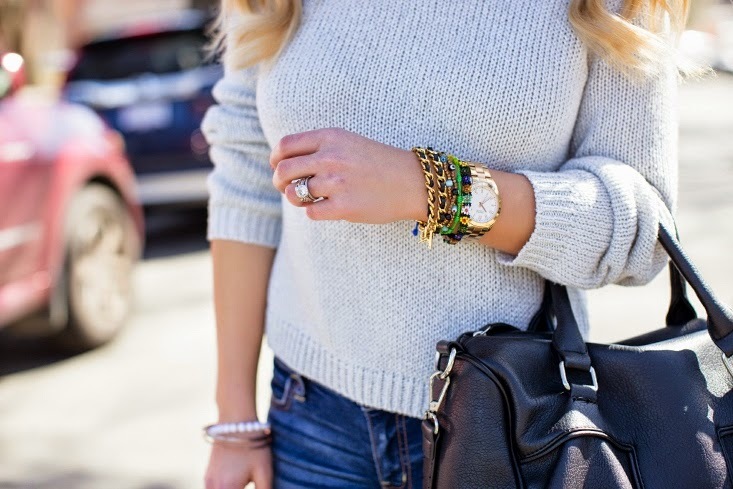 Gorgeous bracelets! Burr..that's way to cold for my blood. I love this red fedora and the trim is just so pretty. I would choose Mr Possessive black. Thanks for this opportunity. I love your hat. I love MISTER POSSESSIVE in black.